The dining room. The house requires very little heat, resulting in energy costs of $30 - $40 a month. The master bedroom niche. 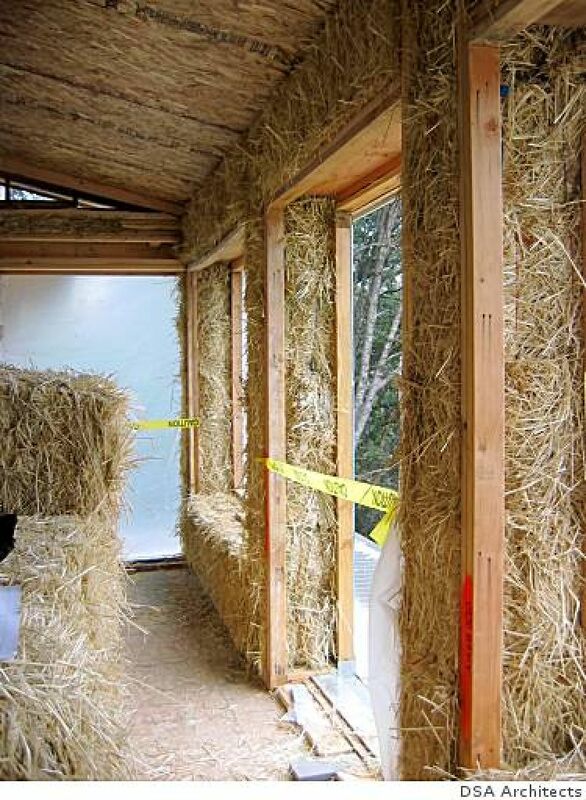 Straw houses are more quiet than regular built homes, the thick straw bale walls provide ideal sound insulation. The east facade of the Oakland's only strawbale house. The 2-foot thick walls of the Roble Road house soak up sunlight during the day and radiate heat at night. They provide at least 3 times the insulation value of a typical Bay Area home. This 2100 sq.ft. two story straw bale home is the first of it's kind in Oakland. Nestled in between the Berkeley and Oakland hills, the thick straw bale walls add a sense of intimacy, coziness, and security. Drought tolerant native landscaping is used throughout the site..